The Boston Harbor fireworks show explodes over the water. Editor’s note: You have reached an article from 2014. For the most current 4th of July information, click here. Celebrating the nation’s birthday with fireworks is a classic American pastime. 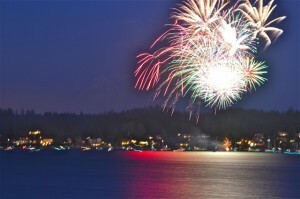 Thurston County residents love their fireworks shows. Start the barbecue early and then transport your crew to one of these local fireworks shows. Each show features professional fireworks with some outstanding scenery. This annual show started small, just a few neighbors coming together to celebrate. It may have grown, but is still a show for the local community supported 100% by donations. The best seats in the house are on the water, so launch the boat and motor over to the Boston Harbor Marina to get a good spot. If you do come by car, be respectful of the neighbors and park outside the Marina area, being cautious not to block driveways or intersections, and walk to a viewing spot. It’s a great stroll through a beautiful neighborhood. Be sure to bring a few dollars to add to the donation cans located at the Marina and at the corner of 73rd and Commercial. If you love the show, let the hard working Boston Harbor Association know it with your support. Bring a picnic and settle in for an evening of family-friendly entertainment at Bush Park in Lacey. The music begins at 6:30 pm to get your family in the spirit of celebrating Independence Day. The fireworks spectacular launches at 10:15 pm and is expected to last at least fifteen minutes. Local businesses have joined with the City of Lacey and Lacey Chamber of Commerce to sponsor this show. Use this map to find out how you can see the Lacey fireworks from neighboring communities around Bush Park. Traffic will get tight around the popular community event. Get parking information here. Celebrate Independence Day in Tumwater. The community loves to spend a full day celebrating Independence Day in Tumwater. 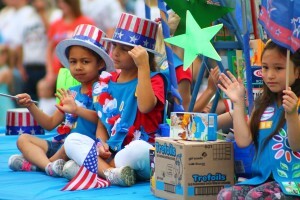 A full day event, the Tumwater Artesian Festival begins with an Independence Day parade at 11:00 am. Find the parade route here. The festival gates open at Tumwater Valley Golf Course at 6:00 pm. While the event is free, there is a $10 parking charge per car so plan to carpool or take public transportation. Watch the races at South Sound Speedway and then stay for the huge fireworks show. 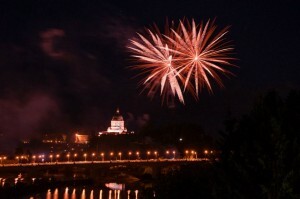 The Grand Finale of Capital Lakefair is the fireworks show near the Capitol. Take a short break from fireworks extravaganzas and then rekindle your love for sparkly shows with the annual Capital Lakefair fireworks show. The fireworks show marks the grand finale of the annual summer festival at Heritage Park next to Capital Lake. The fireworks are synchronized with a soundtrack provided by KGY AM 1240. As a reminder, some fireworks may not be permitted within city limits. You can find specific fireworks regulations for Olympia, Lacey, and Tumwater by following the links.